My name is Bridget Ballenger and I have been teaching Bradley childbirth classes for twelve years. My husband and I have four children, all of which were born naturally using The Bradley Method. 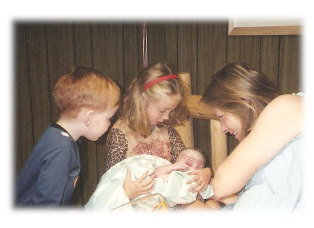 The first two were born in the hospital and the last two were born at home with a midwife. I strongly believe in The Bradley Method and a woman's ability to give birth naturally. I am eager to share what I know with you and help to empower you to have the birth you want. ~We just want to thank you again for teaching us the Bradley Method. We learned so much and you are an excellent teacher. Your wealth of knowledge helped us make important decisions during and after the birth. We are so glad to have been in your class. Mandy S.
~Thank you so much for being our Bradley Instructor and for being so readily available and eager to help, especially when we were at the hospital. We learned so much from you and are very grateful for your support and advice. Lastly, thanks for being a friend. Ben L.